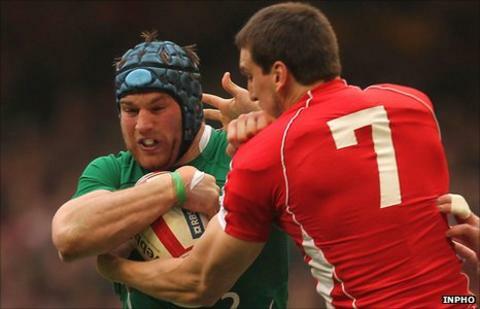 Donncha O'Callaghan is predicting an epic duel between flankers Sean O'Brien and Sam Warburton in Saturday's World Cup quarter-final between Ireland and Wales in Wellington. O'Brien has been a human wrecking ball for Ireland in the tournament while Warburton's work at the breakdown has been a crucial element for the Welsh. "If you were putting together a world XV the two of them would be knocking on the door," said Irish lock O'Callaghan. "It's (going to be) a huge battle." O'Callaghan added: "Sean's been brilliant for us. He's brought a new element altogether to our game. "Warburton is a standout player and we have to do a lot of analysis on him. He's at world-class level. "You hear about guys like Richie McCaw and David Pocock but this guy (Warburton) can do serious damage at the breakdown and in the tackle. "We'll have to find ways to negate him at the breakdown." Several parallels can be drawn between Ireland and Wales, among them their superb form at the World Cup and the fantastic spirit that exists in both squads. O'Callaghan says the superbly-conditioned Irish forged a strong bond during their gruelling warm-up camp at Carlton House (in county Kildare) and the players will now run through brick walls for each other. "There's a club feel to this squad. We did pre-season training together," he said. "You can do all the team bonding you want but when you're at Carlton House on a Friday afternoon and all you want to do is be sick, but one of the lads is encouraging you to get through, that's where you make bonds. "We're seeing the results of that now. The fellas are willing to do anything for each other."